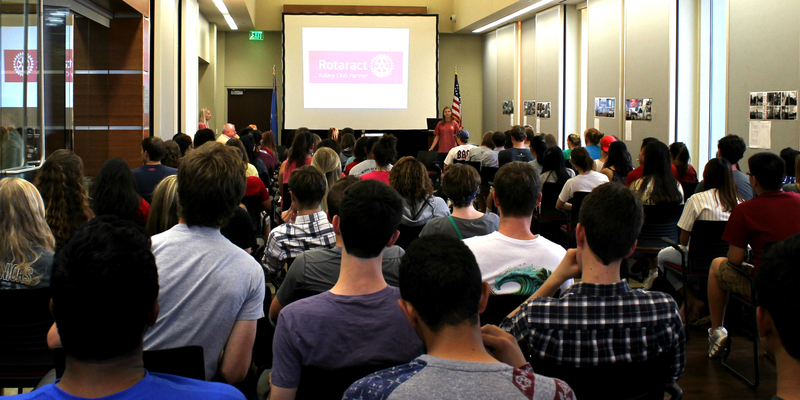 Rotaract Club of Norman at The University of Oklahoma. We're on a mission to make a difference. We're passionate about helping others. We lead. We serve. We're all about changing the world. Rotaract is a service club for young people ages 18 to 30. Sponsored by local Rotary clubs, Rotaract clubs conduct community and international service projects, and participate in professional and leadership development activities. Rotaract provides an opportunity to be involved in exchange programs, in community support and network with business men and women. All Rotaract efforts begin at the local, grassroots level, with members addressing their communities' physical and social needs while promoting international understanding and peace through a framework of friendship and service. We regularly seek chances to serve others. Through our various service projects, we strive to make a difference both in the local community and in the world. We provide opportunities for students to lead, whether through an elected postion on the Board of Directors, or as members of teams and committees. We find ways to connect members with nonprofits or with other Rotarians who have similar passions, visions, or career goals. Ultimately, we bring people who are passionate about serving others into a community of inspiring change-makers. From the earliest days of the organization, Rotarians were concerned with promoting high ethical standards in their professional lives. One of the world's most widely printed and quoted statements of business ethics is The Four-Way Test, which was created in 1932 by Rotarian Herbert J. Taylor (who later served as Rotary International president) when he was asked to take charge of a company that was facing bankruptcy. This 24-word test for employees to follow in their business and professional lives became the guide for sales, production, advertising, and all relations with dealers and customers, and the survival of the company is credited to this simple philosophy. Adopted by Rotary in 1943, The Four-Way Test has been translated into more than a hundred languages and published in thousands of ways. There are no membership requirements to participate in Rotaract service projects or events. However, we do use a tiered membership system to track participation in the organization. We've made sure that the requirements for each membership level are straightforward and easy to complete. Click through the boxes to find out more about the requirements and benefits for each level. This system is in place so we can recognize those who are active in the organization. To be listed as "Interested" you simply need to fill out a contact form at any of our events or meetings. This will add you to our email list and enroll you in the membership system so that we can keep track of the number of events you attend. You are considered a "Member" when you have attended 3 Rotaract meetings or events during the semester. Our Membership Chair will email you with a Membership Application. Once you turn in this application, you will receive a membership pin at the next meeting. At this point, you will also be eligible to apply for a position on the Board of Directors in our annual spring elections. Please keep in mind that at the end of the semester, if you have not attended three events, your event total resets to 0 for the next semester. "Active Members" are those who have attended at least 6 Rotaract meetings or events throughout the semester. These members will be recognized at the end of the semester and entered in a raffle to win a prize. For each event over 6, you will receive an additional raffle ticket. If you have made it to active member status, your event count resets to 3 for the next semester. (In other words, you won’t lose your membership status but will have to prove your active status again). Want to get involved? Stop by one of our meetings! During the school year, our meetings are every other Wednesday from 7 to 8 P.M. in Adams Hall, Room 355. Come join us for free pizza, guest speakers, and announcements about our upcoming service events! Come to Adams Hall Room 310 for the last board meeting! There will be voting for positions then food and fun games! Come to Adams Hall Room 355 for the last general meeting full of food and games! Want to find out more? Have a project idea for us? Feel free to contact us below, we'd love to talk. &COPY; 2017 Rotaract Club of Norman at OU is proudly powered by ThemeZaa.